We are taking a break from sweets today and focusing on another one of my beloved favorites, PIZZA!! We all know how delicious this carby meal is and I’m excited to share my latest version. Today’s spicy sausage pizza is a real kicker. It puts fire on the taste buds. If you are not a fan of spicy food, I’m sorry to say, this pizza is not for you. You may want to try my bbq chicken pizza instead! 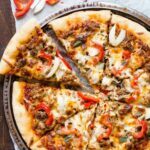 I use my favorite pizza dough and topped it with loads of spicy sausage. I actually used breakfast sausage because I’m not a fan of Italian sausage. 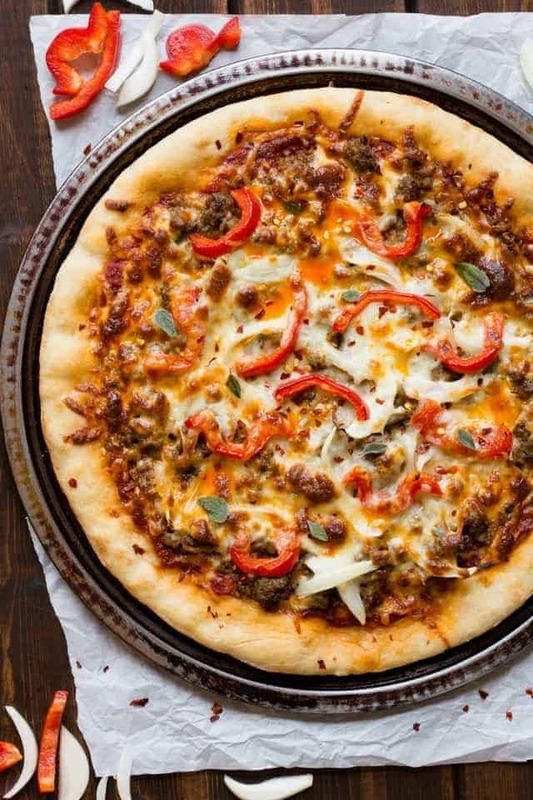 However, you can certainly top your pizza with any spicy sausage you like. Onion and mini sweet peppers are the vegetables I chose to compliment the hot sausage. I love the slight touch of sweetness from the peppers. The onion will cook down and become a little sweet as well! Once the pizza has finished cooking, drizzle it with chili oil and sprinkle some crushed red pepper on top. This is the type of food that makes my husband want to marry me all over again. It’s the right combination of simple ingredients with the perfect amount of heat. He is a spicy food loving guy after all. The pizza is good and ready in just 15 minutes! It’s super simple to make and will please your spicy food loving friends and family. 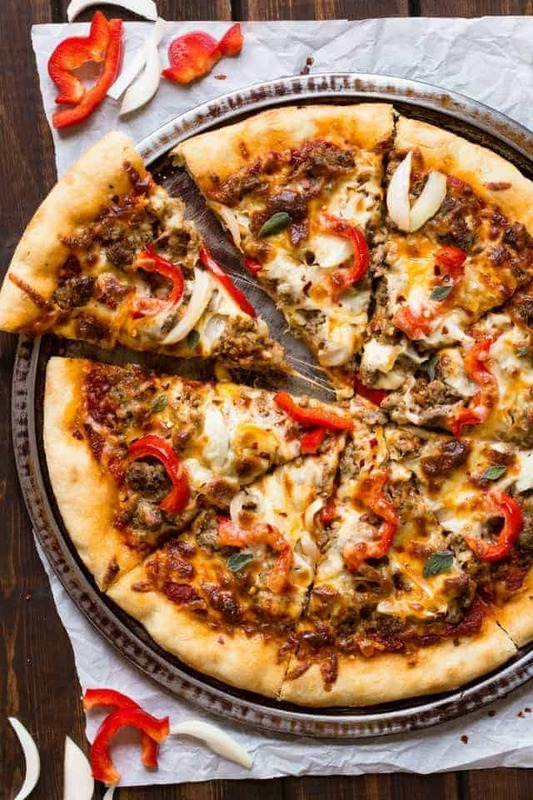 You can use store-bought pizza dough or make your own from scratch. Add chili oil to the marinara sauce for an extra hot kick of flavor. Spicy sausage is used for added heat. Additional flavor and texture come from onions, sweet peppers, and gooey mozzarella. After baking, add a generous drizzle of chili oil and crushed red pepper. If you are using homemade pizza dough, make it according to the recipe instructions. If you are using store-bought dough, remove it from the packaged and shape it into a 12-inch circle. Spray your pizza pan with non-stick spray and dust lightly with flour and gently transfer the dough to your prepared pizza pan. Adjust the rack to the lower middle of the oven and preheat to 475ºF. Spread the marinara sauce evenly over the crust leaving a 1-inch bare rim around the edge. Sprinkle the sausage, onion, and peppers over the sauce. Spread the mozzarella cheese evenly over the top. Bake for 15-17 minutes, or until the crust is golden brown and the cheese has melted. Rotate halfway through the cooking time. Drizzle the chili oil over the top and sprinkle with red pepper. Let cool on a wire rack for 10 minutes before slicing. 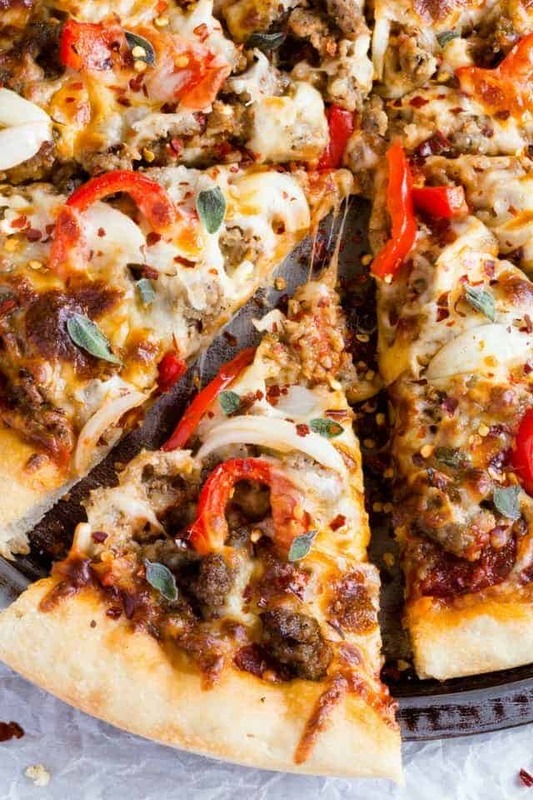 *1/2 pound of store-bought pizza dough can be used instead **If you like an extra kick of heat, try mixing 1 tablespoon of chili oil into the marinara sauce before spreading it over the crust. 0 Response to "Spicy Sausage Pizza"